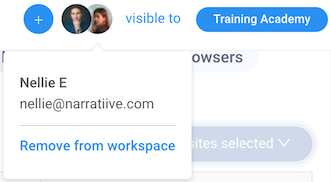 You can add team members to your private and team workspaces. Team members can also join team workspaces without having to be added. Select the workspace that you want to share. Select the add menu (the plus icon to the left of the member icons in the workspace header). Select the team member you wish to add. The workspace is now available in that team member's dashboard. Once you add team members to a workspace, they have full control over that workspace. This includes the ability to remove you from your own workspace. You can remove team members from your private and team workspaces. Select the workspace that you want to remove team members from. Select the icon of the team member you wish to remove. The workspace is no longer available in that team member's dashboard.